Byron Antom Scott was born on the 28th March 1961, in Ogden, Utah USA, and is a former basketball player in the NBA, for such teams as the Los Angeles Lakers, Indiana Pacers, Vancouver Grizzlies, and he also spent a season in the Greek Basket League, playing for Panathinaikos. After retirement, he tried himself as a coach, and has been quite successful, earning the NBA Coach of the Year award in 2008. 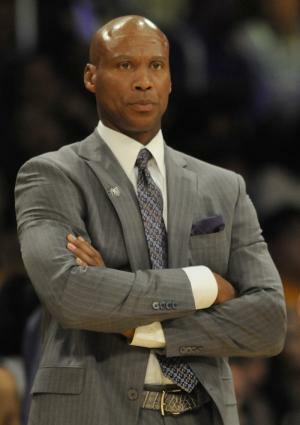 Have you ever wondered how rich Byron Scott is, as of mid-2016? According to sources, it has been estimated that Byron Scott`s net worth is as high as $14 million, an amount he has acquired through his successful career as a sportsman, playing and coaching the popular sport of basketball. Byron spent his childhood days in Inglewood, California, and attended Morningside High School where he fell in love with basketball, and ever since has hardly dropped the ball from his hands. After he matriculated from high school, Byron enrolled at Arizona State University, but quit in his third year of college and declared for the 1983 NBA Draft, which marked the beginning of his professional career. He was selected as the 10th overall pick by the San Diego Clippers, however, he was traded to the Los Angeles Lakers, signing a rookie contract which certainly increased his net worth. He played for the Lakers until 1993, and won three NBA Championships, being one of the best Lakers on court alongside Magic Johnson, James Worthy and Kareem Abdul-Jabbar. In his first season as a Laker, Byron averaged 10.6 points in 74 games, which earned him selection into the NBA All-Rookie First Team. However, since then his numbers increased, and in the following season, he averaged 16.0 points, which greatly helped the Lakers win the title. He continued successfully, becoming the Lakers` starting shooting guard, and leading them to two more titles in 1987 and 1988, averaging 17.0 and 21.7 points per game in those seasons. After the Lakers, he joined the Indiana Pacers, but his game numbers were never the same, and he only stayed for two years before joining the Vancouver Grizzlies for one season. After that, he returned to the Lakers, and played in 79 games alongside Shaquille O` Neal and the young Kobe Bryant. Byron then left for Europe, and played one season for Panathinaikos, winning the Greek Basketball League with the team. Following his contract expiration, he decided to quit playing, however, still stayed in the sport as a coach. Scott’s first engagement was as the assistant coach for the Sacramento Kings in 1998, but two years later he was appointed as the head coach of the New Jersey Nets, and served in that position until the mid- 2003-2004 season, when he was fired after series of por results. However, during this stint, he led the Nets to two NBA Finals, but lost to the San Antonio Spurs and Los Angeles Lakers. Scott’s net worth increased further after he was appointed as the head coach of the New Orleans Hornets, and led them to two post seasons, but lost in Conference finals, one year against the San Antonio Spurs, and the second year against the Denver Nuggets. The following season he was fired, and then worked briefly as an analyst for the show NBA on ESPN. Afterwards, he became the head coach of the Cleveland Cavaliers, which also added to his net worth, and stayed in that position until the end of 2012-2013 season. He didn`t have much success, but after that joined the Lakers, again, this time as a coach, given the chance to coach the legendary Kobe Bryant, with whom he had played one season back in the 1990s, but after two unsuccessful seasons, Byron was released by the Lakers. Regarding his personal life, Scott was married to Anita from 1985 until March 2014; the couple has three children. Byron is also recognized for his philanthropic activities; he has started a non-profit organization The Byron Scott Children’s Fund, which raises money for numerous children’s charities, and so far has collected more than $15 million. 2 Coached the New Jersey Nets to the NBA Finals in consecutive seasons (2001-2002 and 2002-2003). 3 Played 10 seasons with the Lakers (1983-1984 to 1992-1993), two seasons with the Indiana Pacers (1993-1994 to 1994-1995), one with the Vancouver Grizzlies (95-96), and rejoined the Lakers for his final season (96-97). 4 Started at guard alongside Magic Johnson on three Laker NBA championship teams (1984-1985, 1986-1987, 1987-1988). 5 Drafted as the 4th pick in the 1st round of the 1983 NBA Draft by the Los Angeles Lakers. Lakers got the pick by trading Norman Nixon to the Los Angeles Clippers.